Ed, Edd n Eddy is a Canadian-American animated comedy television series created by Danny Antonucci for Cartoon Network, and the sixth of the network's Cartoon Cartoons. The series revolves around three preteen boys named Ed, Edd (called "Double D" to avoid confusion with Ed), and Eddy—collectively known as "the Eds"—who live in a suburban cul-de-sac in the fictional town of Peach Creek. Under the unofficial leadership of Eddy, the trio frequently invent schemes to make money from their peers to purchase their favorite confection, jawbreakers. Their plans usually fail, leaving them in various, often humiliating, predicaments. Adult cartoonist Antonucci was dared to create a children's cartoon; while designing a commercial, he conceived Ed, Edd n Eddy, designing it to resemble classic cartoons from the 1940s–1970s. He pitched the series to Cartoon Network and Nickelodeon, but the latter demanded creative control, leading to him making a deal with the former and the series premiering on January 4, 1999. During the show's run, several specials and shorts were produced in addition to the regular television series. The series concluded with a TV movie, Ed, Edd n Eddy's Big Picture Show, on November 8, 2009. Ed, Edd n Eddy received generally positive reviews from critics and became one of Cartoon Network's most successful original series. It won a Reuben Award, two Leo Awards and a SOCAN Award, and was also nominated for another four Leo Awards, an Annie Award and two Kids' Choice Awards. The show attracted an audience of 31 million households, was broadcast in 120 countries, and proved to be popular among children, teenagers, and adults. With nearly an 11-year run, Ed, Edd n Eddy is currently the longest-running Cartoon Network original series. Ed, Edd n Eddy follows the lives of "the Eds", three preteen boys who all share variations of the name Ed, but differ greatly in their personalities: Ed (voiced by Matt Hill) is the strong, dim-witted dogsbody of the group; Edd (Samuel Vincent), called Double D, is an inventor, neat freak, and the most intelligent of the Eds; and Eddy (Tony Sampson) is a devious, quick-tempered, bitter con artist, and self-appointed leader of the Eds. The three devise plans to scam the cul-de-sac kids out of their money, which they want to use to buy jawbreakers. However, problems always ensue, and the Eds' schemes usually end in failure and humiliation. The cul-de-sac kids do not include the Eds as part of their group, making the trio outcasts. The group of kids consist of: Jonny 2×4 (David Paul "Buck" Grove) is a loner whom his peers consider to be a nuisance, and spends most of his time with his imaginary friend, a wooden board named Plank; Jimmy (Keenan Christensen) is a weak, insecure, and innocent yet accident-prone child, who is most often seen spending his time with Sarah (Janyse Jaud), Ed's spoiled and ill-tempered younger sister; Rolf (Peter Kelamis) is an immigrant, who often participates in unconventional customs; Kevin (Kathleen Barr) is a cynical and sardonic jock who detests the Eds, particularly Eddy; Nazz (Tabitha St. Germain; Jenn Forgie; Erin Fitzgerald), usually seen with Kevin, is a stereotypical dumb blonde and an unattainable love interest for the cul-de-sac kids. All of the cul-de-sac kids share a common fear of the Kanker Sisters, Lee (Janyse Jaud), May (Erin Fitzgerald; Jenn Forgie), and Marie (Kathleen Barr), three teenage girls who live in a nearby trailer park and are in love with the Eds. Aside from the Eds, the other cul-de-sac kids, and the Kanker Sisters, no other characters appeared in the series until the fifth season, when the silhouettes of other people were occasionally shown, and in "Mission Ed-Possible", the arms of Eddy's father and Ed's mother were seen. In the series finale, Ed, Edd n Eddy's Big Picture Show, Eddy's adult brother (Terry Klassen) was seen for the first time, making him the only non-main character, and the only adult character to ever fully appear on the show. The series took place mostly within the fictional town of Peach Creek, and new locations were rarely introduced. The first four seasons of the show are set during a seemingly endless summer vacation, though from the fifth season onwards, the characters are shown attending junior high school in the fall and winter months. 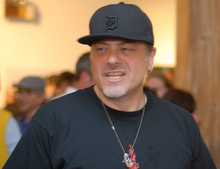 Danny Antonucci, creator, director, executive producer, and co-writer of Ed, Edd n Eddy, produced the series on a dare. Although cartoonist Danny Antonucci began his career by working as an animator on various children's series for Hanna-Barbera, his later solo works were edgy and aimed at adult audiences. He gained notoriety with the 1987 short film Lupo the Butcher and then, after founding his own production studio, a.k.a. Cartoon in 1994, created the series The Brothers Grunt for MTV. It was quickly cancelled, however, upon being met with generally poor reviews. On a dare, Antonucci then decided that he would try producing a children's animated series of his own. While designing a commercial, he ended up drawing three characters that he felt particularly pleased with. Growing excited over their potential, he named them Ed, Edd, and Eddy and spent the following months developing a show around them. He faxed a one-page concept sheet to Cartoon Network and Nickelodeon in 1996. Both studios quickly responded, Cartoon Network in only 20 minutes, and were enthusiastic and wanted to see more; they each demanded creative control, however, and Antonucci refused. After Cartoon Network agreed to let Antonucci have control of the show, conversations between Antonucci and the studio continued. Vice president of programming and production of Cartoon Network, Mike Lazzo, showed high interest in the series and requested a show bible, which came through by fax, a few pages at a time, over a period of the next few months. After an affirmative response from Cartoon Network president Betty Cohen, the legal paperwork and deal-making began, followed by a start-up meeting at the Chateau Marmont Hotel in Los Angeles. A deal was made that Antonucci's studio, a.k.a. Cartoon, would produce Ed, Edd n Eddy, the first Cartoon Network original series to be produced by an outside production company rather than Cartoon Network's Hanna-Barbera. The series also entered production and bypassed a seven-minute short; this marked the first time that one of the studio's original series had ever done this. According to Antonucci, he based the characters on real people in his life. The personalities of Ed, Double D, and Eddy are based on his own traits as well as the activities of his two sons, while the cul-de-sac children and the Kanker sisters were all based on children he grew up with. Rolf is based on Antonucci and his cousins, since he was part of an Italian immigrant family, and grew up in a first generation foreign household with different customs and ways of living, compared to those born in Canada. Rolf is me and all of my cousins. My parents were right off the boat so I grew up playing to two worlds, the modern world and the 1950s Italian world. My parents like Rolf's lived — still live in the past, with strong traditions and strange cooking and having a hard time assimilating to modern life. Jimmy is based on one of his cousins, who was rather feminine and spent most of his time playing with girls rather than with boys. Jonny and Plank are inspired by one of Antonucci's childhood friends, a loner who spent most of his time outside with his blanket. He stated that he believed it was important to add Plank, a board of wood, to the show, and that he "thought it would be really cool to do the show with Plank taking on a character of his own" and to cause Jonny to do things he would usually never do. Some wanted Plank to be able to talk, smile and blink as if he was alive, but Antonucci insisted that it should be treated as a piece of wood, brought to life by Jonny's imagination. Matt Hill, Samuel Vincent, and Tony Sampson were respectively cast as Ed, Double D, and Eddy. David Paul "Buck" Grove and Keenan Christensen played the parts of Jonny 2×4 and Jimmy, respectively, while Sarah was voiced by Janyse Jaud. Peter Kelamis voiced Rolf, while Kathleen Barr was cast as Kevin. Nazz was voiced by Tabitha St. Germain in season 1, Jenn Forgie in season 3 and Erin Fitzgerald in seasons 2, 4, 5 and 6. Fitzgerald also played the part of May, one of the Kanker Sisters, except in season 3 when she was voiced by Jenn Forgie. The other two Kanker sisters, Marie and Lee, were voiced by Kathleen Barr and Janyse Jaud. Eddy's adult brother is mentioned frequently throughout the series but does not appear until Ed, Edd n Eddy's Big Picture Show, where he is voiced by series voice director Terry Klassen. Antonucci, an advocate of hand-drawn animation, wanted to ensure Ed, Edd n Eddy was produced in a way similar to cartoons from the 1940s to 1970s. As a result, the series was the last major animated series to use traditional cel animation; the cels were shipped to Korea for creating the initial animation, and then later edited back at Antonucci's a.k.a. Cartoon studio. The first four seasons were produced traditionally. Starting with Ed, Edd n Eddy's Jingle Jingle Jangle in 2004, the series switched to digital ink and paint. To give the impression of movement, Ed, Edd n Eddy uses "boiling lines" or shimmering outlines which Antonucci likens it to cartoons of the 1930s. IGN has compared to Squigglevision, and Animation World Magazine wrote that the way the line varies and shakes gives the animation a distinctive and spontaneous feeling, as if it were drawn by children. The boiling line is created by tracing off a drawing three times through sheets of paper. Antonucci explained that he felt it "helps keep the characters alive" and that he wanted to depart from other Cartoon Network series and pay homage to the classic cartoon era. All the children have multicolored tongues; Antonucci said that the idea came after he saw his son and his friends with different-colored tongues because of eating different candy while he was working on a storyboard. The characters went through a number of "walking cycles," a process used to determine how each character should walk or run, turn around, blink, etc. before the crew came up with the final product. Antonucci showed the theme song to the studios when first pitching the series, thinking it would be better than only looking at drawings. It was inspired by the Bob Crosby and The Big Cats song "Big Noise from Winnetka," which was whistled, something Antonucci enjoyed doing as a child. Composed by Patric Caird, who created all the music in the series, Antonucci performed the whistling himself. The theme song was featured on the compilation album Cartoon Medley. The title sequence was created by Paul Boyd. Although Ed, Edd n Eddy was originally set to premiere on November 7, 1998, the pilot, "The Ed-touchables / Nagged to Ed," aired on January 4, 1999, as the sixth Cartoon Cartoon, due to minor post-production delays. During the series' original run, episodes often aired as a part of Cartoon Network's weekly programming block "Cartoon Cartoon Fridays." Cartoon Network ran several marathons for either commercial promotions or special airings of one of their shows. The eight-hour "Boy Girl, Boy Girl" marathon ran on March 7, 1999, airing episodes of Ed, Edd n Eddy and The Powerpuff Girls, which had been Cartoon Network's two newest series at the time. Later that year, Ed, Edd n Eddy was featured with other original Cartoon Network series in the third annual "Cartoon Cartoon Weekend," a fifty-three-hour marathon, which ran from August 20 to August 22. In 2002, the show was included in the similar "Cartoon Cartoon Marathon Weekend," which ran from August 23 to August 25. The six-hour "Ed's Day Off Marathon" aired 22 episodes on January 19, 2004, in celebration of Martin Luther King, Jr. Day. "The Best Day Edder," in which every episode was shown in chronological order, ran from April 27 to April 28, 2007, and ended with the previously unbroadcast season five finale, which was promoted as the "final episode ever." However, it was quickly followed by "The Eds are Coming" in the next month, as part of a special alien-themed event called "Cartoon Network Invaded." As of May 2, 2007, "The Best Day Edder" provided Cartoon Network their best ratings of the year. A seven-hour Sunday marathon, which ran before the premiere of Ed, Edd n Eddy's Big Picture Show, posted double-digit delivery gains among children ages 9–14 (up 14%), boys ages 9–14 (up 16%) and girls ages 6–11 (up 17%), compared to the same time frame last year, highlighting the network's weekend performance. At the July 2007 San Diego Comic-Con, a cut segment from the season four finale "Take This Ed and Shove It" was screened at the Ed, Edd n Eddy panel. The series' fourth season was originally ordered as the last, but two additional seasons and four specials, including a movie, were ordered as a result of the series' popularity. The series' finale movie, Ed, Edd n Eddy's Big Picture Show, aired on November 8, 2009, officially ending the series. Along with an additional fifth and sixth season, Cartoon Network ordered three holiday specials that originally aired in 2004 and 2005. "Ed, Edd n Eddy's Jingle Jingle Jangle," the first, is a Christmas special aired on December 3, 2004. Valentine's Day's "Ed, Edd n Eddy's Hanky Panky Hullabaloo" originally aired on February 11, 2005. The final, Halloween special, "Ed, Edd n Eddy's Boo Haw Haw" aired on October 28, 2005. Antonucci stated that "Boo Haw Haw" was one of his favorite Ed, Edd n Eddy episodes that he worked on. On May 11, 2007, a fourth special, "The Eds are Coming, the Eds are Coming" aired; however, it was not a holiday special, but an adjunct to other Cartoon Network series Foster's Home for Imaginary Friends, My Gym Partner's a Monkey, Camp Lazlo, and The Grim Adventures of Billy & Mandy in the alien-themed mini-series Cartoon Network Invaded that aired all five specials from May 4 to May 28, 2007. 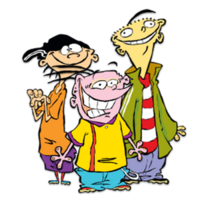 Besides their own series, Ed, Double D, and Eddy have also appeared in other cartoon series. They appeared in an episode of Foster's Home for Imaginary Friends and were drawn using that series' style of animation, and made a short cameo in "The Grim Adventures of the KND," a crossover of The Grim Adventures of Billy & Mandy and Codename: Kids Next Door. They also appeared on a small crossover poster during its credits entitled Ed, Edd n Mandy. In 2012, Double D made an appearance in the animated sketch comedy Cartoon Network series Mad episode "Once Upon a Toon." The show was featured in the 2002 edition of Cartoon Network's fictional awards program, The 1st 13th Annual Fancy Anvil Awards Show Program Special: Live in Stereo. It won Best Performance by an Inanimate Object in a Dramatic Role for the character of Plank, and Best Performance by a Team in a Cartoon Series for the characters of Ed, Double D, and Eddy. The character of Sarah was nominated for Best Performance by a Female in a Cartoon Series, but lost to Bubbles from The Powerpuff Girls. In 2004, the Eds appeared in a short series of basketball commercials with NBA All-Star Steve Francis. Ed appeared in the "Cartoon Network Elections 2004" with Grim from The Grim Adventures of Billy & Mandy as a team, and they ended up winning, due to the highest number of votes by viewers. Ed, Edd n Eddy attracted an audience of 31 million households, was broadcast in 120 countries, and was popular among both children and adults. According to Cartoon Network executive Linda Simensky, the first season did "remarkably well" in ratings following its premiere, becoming one of the top-rated series on the network. It was Cartoon Network's most popular show among boys ages 2–11. In 2005, it was reported that Ed, Edd n Eddy was the number one rated show on Cartoon Network and was known to 79% of children aged 6–11. The series ran for nearly 11 years, making it the longest-running Cartoon Network original series, and at the time of its finale, the longest-running Canadian-produced animated series. It is tied with Blue's Clues, Wonder Pets! and Mickey Mouse Clubhouse as the ninth longest-running American animated series. Ed, Edd n Eddy received generally positive reviews from critics. David Cornelius of DVD Talk considered the Eds to be child equivalents of The Three Stooges, believing that "the series revels in the sort of frantic, often gross humor kids love so much, and there's just enough oddball insanity at play to make adults giggle just as easily." Cornelius also wrote that the "animation is colorful and intentionally bizarre; bold lines forming the characters and backgrounds wiggle and morph in a delirious haze. This is animation that's, well, really animated." Despite this, not all reception of the show was positive. Terrence Briggs of Animation World Magazine considered every second of the show "filler" and lamented that the main characters are drawn as "products from the school of acid-trip caricature." After Briggs' review was published, a large number of letters supportive of the show were sent to the magazine, prompting it to "take a second look" at the show. Different reviewers then gave it a positive review, calling it a "fresh show with very different approaches." During its run, Ed, Edd n Eddy was nominated for a Reuben Award, six Leo Awards, an Annie Award, two Kids' Choice Awards and a SOCAN Award, winning the Reuben Award, two Leo Awards and the SOCAN Award. It was ranked seventh on ScrewAttack's "Top Twenty Cartoon Network Shows." Desi Jedeikin of Smosh.com listed Ed, Edd n Eddy on the website's list of "9 Cartoons That Need a Reboot." Complex included Eddy's room on their list of "Movie and TV Characters' Bedrooms You Wished Were Yours," and ranked Jimmy 14th on their list of "15 Artistic Characters We Miss From Our Childhood." Cracked.com praised the show's high level of violence, stating that it "set the bar on cartoon violence for anything that was played on Cartoon Network, and thus far, none have surpassed them." Bob Higgins, head of creative at Wild Brain, considered Ed, Edd n Eddy to be a "landmark in animation." In August 2002, the New York Museum of Television and Radio featured the episode "An Ed Is Born" as part of the special program "Cartoon Power! Celebrating Cartoon Network's 10th Birthday". Cartoon Network produced short cartoons involving the Eds which were shown during commercial breaks. A short music video was produced with stylized versions of Ed, Edd, Eddy and Sarah, entitled "The Incredible Shrinking Day" (listed on the Season 2 DVD as "I'm Not Coming in Anymore"), which aired on Cartoon Network in 2002 and 2003. In the video, Sarah uses a potion to shrink the Eds to a size capable of playing in her dollhouse, with predictable results. Plank starred in a similar video called "My Best Friend Plank," which aired in 2002. The made-for-TV movie Ed, Edd n Eddy's Big Picture Show served as the series' finale and premiered in the United States on November 8, 2009; although it had completed production a year earlier and first aired in Scandinavia, Australia, and Southeast Asia. The plot focuses on the Eds' search for Eddy's Brother, a character mentioned several times throughout the series, but never seen until the film. He is voiced by series voice director Terry Klassen. The film was directed by Antonucci, who also co-wrote the script with Rachel Connor, Jono Howard, Mike Kubat, and Stacy Warnick. The story was written by Joel Dickie, Steve Garcia, Jim Miller, Raven Molisee, and Scott Underwood, while the score was written by series composer Patric Caird. The film achieved huge ratings success for Cartoon Network with high delivery gains. Ed, Edd n Eddy was regularly featured in DC Comics' Cartoon Network Block Party (originally Cartoon Cartoons, the collective name of original Cartoon Network series from 1995 to 2003) comic books, along with other Cartoon Network series. Two books based on the series have been released, both published by Scholastic Inc. in 2005: Ed, Edd n Eddy: Lots of Laughs, written by Jesse Leon McCann, and Ed, Edd n Eddy: Book of Extreme Excuses, written by Howie Dewin. Four video games based on the series have been produced. Ed, Edd n Eddy: Jawbreakers! was released on September 15, 2003, for the Game Boy Advance. Ed, Edd n Eddy: Giant Jawbreakers was released on March 4, 2004, for mobile phones. Ed, Edd n Eddy: The Mis-Edventures was released in 2005 for the Nintendo GameCube, PlayStation 2, Xbox, Game Boy Advance, and PC. The most recent game, Ed, Edd n Eddy: Scam of the Century, was released for the Nintendo DS on October 26, 2007. The games were met with generally mixed reception. Characters and locations from the show appear in other Cartoon Network video games, including 2003's Cartoon Network: Block Party and Cartoon Network Speedway. All three main characters, and the Kanker sisters, appear as non-playable "Nano" characters in the massively multiplayer online game Cartoon Network Universe: FusionFall. The first two seasons of Ed, Edd n Eddy were released as DVD box sets by Warner Home Video and Madman Entertainment in 2006 and 2007. The Fools' Par-Ed-Ise DVD, the box sets of the first two seasons, and several Ed, Edd n Eddy T-shirts are available for purchase on the Cartoon Network Shop. Selected episodes from the series were also featured on various Cartoon Network compilation DVDs. All five seasons of the series, as well as Ed, Edd n Eddy's Big Picture Show, are available for download on the iTunes Store. The first four seasons were available on Netflix from March 2013  until March 2015. The third season can be downloaded at Google Play and Amazon. The Eds and Sarah have been free toys in children's meals for Subway. In the United Kingdom the character of Eddy was given away in Kelloggs cereal boxes as one of the Cartoon Network Wobble Heads in 2003 . Edifying Ed-Ventures 6 May 10, 2005 May 15, 2006 N/A Contains the episodes "Sir Ed-a-Lot," "Who, What, Where, Ed," "Avast Ye Eds," "Know-It-All Ed," "Mirror, Mirror, on the Ed," and "Hot Buttered Ed." Bonus features include "Club Ed: The Rules and Regulations," "My Best Friend Plank" music video, "Plank's Perspective," and The Grim Adventures of Billy & Mandy episode "Nursery Crimes." Fools' Par-Ed-Ise 6 March 21, 2006 N/A N/A Contains the episodes "If It Smells Like an Ed," "Take This Ed and Shove It," "One Size Fits Ed," "A Case of Ed," "Here's Mud in Your Ed," and "Fool on the Ed." Bonus features include a studio tour, "The Plank Family Players," and a behind-the-scenes look at Ed, Edd n Eddy: The Mis-Edventures. The Complete First Season 26 October 10, 2006 N/A July 18, 2007 Contains all 26 episodes from the first season. Bonus features include an interview with the creator, "How to make an Ed, Edd n Eddy cartoon," "How to Draw Eddy," and a Cartoon Network commercial bumper featuring Jimmy and Plank. The Complete Second Season 26 April 24, 2007 N/A N/A Contains all 26 episodes from the second season. Bonus features include "Behind the Eds," "The Incredible Shrinking Day" music video, and "How to Draw Ed." ^ a b c d e f Danny Antonucci (October 10, 2006). Ed, Edd n Eddy: The Complete First Season—Interview with the Creator (DVD). Warner Home Video. Event occurs at 0:22–2:34. ^ Beard, William; White, Jerry (June 1, 2002). North of Everything. University of Alberta Press. p. 63. ISBN 978-0-88864-390-2. ^ a b c d e f g h i j k l m Danny Antonucci (April 24, 2007). Ed, Edd n Eddy: The Complete Second Season (DVD). Warner Home Video. ^ a b c d Simensky, Linda (June 22, 1999). "Ed, Edd 'n' Eddy: Three Guys, One 'Toon". Take One. ^ a b c Danny Antonucci (October 10, 2006). Ed, Edd n Eddy: The Complete First Season—Interview with the Creator (DVD). Warner Home Video. Event occurs at 2:15–4:39. ^ a b "The Best Day Edder". Ed, Edd n Eddy. April 27–28, 2007. Cartoon Network. ^ a b DeVries, Jack (November 1, 2007). "Ed, Edd 'n Eddy: Scam of the Century Review". IGN. News Corporation. Retrieved July 30, 2012. ^ a b Shumway, Matt; Wayne, Lamont (June 1999). "Ed, Edd n Eddy: A Unique Approach". Animation World Magazine (4.3). Retrieved May 8, 2017. ^ "Various – Cartoon Medley". Discogs. Zink Media. Retrieved 2012-12-28. ^ Amidi, Amid (August 20, 2007). "More about the Death of Paul Boyd". Retrieved January 27, 2013. ^ King, Susan (September 6, 1998). "Wake-Up Calls". Los Angeles Times. Tribune Company. Retrieved May 17, 2013. ^ "Cartoon Network delays Ed, Edd n Eddy". Animation World Network. September 16, 1998. Retrieved May 8, 2012. ^ CAB'S Network/Systems Relations Committee; Cabletelevision Advertising Bureau (2001). "Cable Network Profiles: A Comprehensive Sales Guide to Basic Cable Networks". CAB, Cabletelevision Advertising Bureau: 44. Retrieved June 2, 2013. ^ Amidi, Amid (March 8, 1999). "Boy Girl, Boy Girl marathon is coming to Cartoon Network". Animation World Network. Archived from the original on December 3, 2013. Retrieved June 4, 2013. ^ King, Susan (March 4, 1999). "Highlights Include Awards Shows and a Salute to Lloyd Webber". Los Angeles Times. Tribune Company. Retrieved June 4, 2013. ^ Kilmer, David (August 5, 1999). "Cartoon Network offers sneak peeks". Animation World Network. Retrieved June 6, 2013. ^ Godfrey, Leigh (August 21, 2002). "Cartoon Cartoon Marathon Weekend Begins Friday". Animation World Network. Retrieved June 5, 2013. ^ "Ed, Edd n Eddy Ed's Day Off Marathon Jan. 19". Animation World Network. January 19, 2004. Retrieved May 13, 2012. ^ Bynum, Aaron H. (April 25, 2007). "CNs "Best Day Edder"". Animation Insider. Archived from the original on February 21, 2013. Retrieved 2012-12-02. ^ a b "Cartoon Network Invaded by Aliens in May". Animation World Network. May 1, 2007. Retrieved May 9, 2012. ^ Bynum, Aaron H. (May 2, 2007). ""Best Day Edder" Ratings". Animation Insider. Archived from the original on May 27, 2011. Retrieved May 7, 2013. ^ a b Seidman, Robert (November 10, 2009). "Cartoon Network/Adult Swim Nielsen ratings notes for week ending November 8, 2009". TV by the Numbers. Retrieved May 14, 2012. ^ Hazuda, Matt (July 27, 2007). "TZ @ SDCC: Ed, Edd n Eddy Say Farewell". ToonZone. Retrieved May 7, 2012. ^ a b "Cartoon Network Greenlights 26 New Ed, Edd n Eddys". Animation World Network. June 15, 2004. Retrieved May 13, 2012. ^ a b c d Kapko, Matt (November 16, 2009). "Ed, Edd 'n Eddy's Big Picture Show Premiers in the U.S." Animation World Network. Retrieved April 30, 2011. ^ "Ed, Edd n Eddy's Ring in Holiday Special Dec. 3 on Cartoon Network". Animation World Network. November 30, 2004. Retrieved May 13, 2012. ^ "New Ed, Edd n Eddy Valentine's Day Special on Cartoon Network". Animation World Network. February 11, 2005. Archived from the original on June 11, 2015. Retrieved May 13, 2012. ^ "Cartoon Network Scares Up Halloween Programming". Animation World Network. October 27, 2005. Archived from the original on October 5, 2013. Retrieved May 10, 2012. ^ "Eddie Monster". Foster's Home for Imaginary Friends. Season 3. July 22, 2005. Cartoon Network. ^ "The Grim Adventures of the Kids Next Door". The Grim Adventures of Billy & Mandy / Codename: Kids Next Door. November 11, 2007. Cartoon Network. ^ "Once Upon a Toon". Mad. October 4, 2012. Cartoon Network. ^ The 1st 13th Annual Fancy Anvil Awards Show Program Special: Live in Stereo. Cartoon Network. March 23, 2002. ^ DeMott, Rick (February 13, 2004). "Cartoon Network Matches Up Basketball Stars & Toons". Animation World Network. Retrieved June 2, 2012. ^ "Cartoon Network Elections 2004". (Cartoon Network shorts). 2004. Cartoon Network. ^ "Danny Antonucci". Ottawa International Animation Festival. Retrieved June 19, 2012. ^ Sarrazin, Marc-André (February 26, 2005). "Midway Enters Publishing Agreement For 3 Cartoon Network Shows". NintendoSpin.com. Archived from the original on September 4, 2012. Retrieved May 26, 2012. ^ "Midway and Cartoon Network Enterprises Ship the Outrageously Wacky Ed, Edd N Eddy(TM): The Mis-Edventures; Top-Rated Animated Kids Show Now Available For All Major Platforms". Business Wire. Berkshire Hathaway. October 31, 2005. Retrieved August 20, 2012. ^ Grove, Chris (June 15, 2007). "CN/D3 Unleash New Ed, Edd n Eddy Game". Animation Magazine. Retrieved May 2, 2011. ^ a b Cornelius, David (April 24, 2007). "Ed, Edd 'n' Eddy — The Complete Second Season". DVD Talk. Retrieved July 31, 2007. ^ Briggs, Terence (February 1999). "Ed, Edd n Eddy: Caught in a Circle". Animation World Magazine (3.11). Archived from the original on September 7, 2008. Retrieved July 31, 2008. ^ Jing412 (October 19, 2012). "Top Twenty Cartoon Network Shows (1–01)". ScrewAttack. Craig Skistimas. Archived from the original on January 3, 2013. Retrieved October 20, 2012. ^ Jedeikin, Dese (October 14, 2011). "9 Cartoons That Need A Reboot". Smosh.com. Archived from the original on 2011-10-17. Retrieved June 16, 2008. ^ Aquino, Tara; Scarano, Ross (June 30, 2013). "Eddy on Ed, Edd, and Eddy". Complex. Complex Media. Retrieved September 21, 2013. ^ Cheng, Susan (August 31, 2013). "14. Jimmy". Complex. Complex Media. Retrieved September 21, 2013. ^ "Cartoon Violence". Retrieved April 24, 2014. ^ Moody, Annemarie (September 5, 2008). "Antonucci Makes Tunes with W!LDBRAIN". Animation Magazine. Retrieved June 16, 2012. ^ Godfrey, Leigh (June 24, 2002). "Ed, Edd N Eddy Show Their Cartoon Power!". Animation World Network. Retrieved August 25, 2014. ^ "Animation World News: Awards". Animation World Magazine (4.3). Archived from the original on December 15, 2013. Retrieved April 30, 2012. ^ "2000 Winners". Leo Awards. Retrieved May 2, 2012. ^ "List of Nominees and Winners". Leo Awards. Archived from the original on August 3, 2001. Retrieved May 2, 2012. ^ "29th Annual Annie Award Nominees and Winners (2001)". Annie Awards. ASIFA-Hollywood. Retrieved July 27, 2011. ^ "Leo Awards 2004 Nominees – Animation Program or Series". Leo Awards. Archived from the original on August 22, 2004. Retrieved May 2, 2012. ^ "2005 Winners". Leo Awards. Retrieved May 2, 2012. ^ "2005 Nickelodeon Host/Nominees Release". Nickelodeon. February 8, 2005. Archived from the original on September 5, 2014. Retrieved May 5, 2012. ^ "Animation Program or Series". Leo Awards. Archived from the original on October 17, 2006. Retrieved May 2, 2012. ^ "Nominees 2007". Leo Awards. Retrieved May 2, 2012. ^ "2008 Host & Nominees Release". Nickelodeon. February 7, 2008. Retrieved May 5, 2012. ^ "20th Annual SOCAN Awards Toronto 2009 – Winners List". Society of Composers, Authors and Music Publishers of Canada. Archived from the original on February 22, 2012. Retrieved January 3, 2013. ^ "The Incredible Shrinking Day". Ed, Edd n Eddy. 2002–2003. Cartoon Network. ^ "My Best Friend Plank". Ed, Edd n Eddy. 2002. Cartoon Network. ^ "Ed, Edd n Eddy's Big Picture Show". United States Copyright Office. Retrieved June 17, 2012. ^ a b McLean, Thomas J. (November 13, 2009). "Ed, Edd n Eddy Movie Wraps Show with Big Ratings". Animation Magazine. Retrieved June 17, 2012. ^ a b c Ed, Edd n Eddy's Big Picture Show—Credits. Cartoon Network. November 8, 2009. ^ McCann, Jesse Leon (2005). Ed, Edd n Eddy: Lots of Laughs. Ed, Edd n Eddy. Scholastic Inc. p. 92. ISBN 978-0-439-77942-5. ^ Dewin, Howie (2005). Ed, Edd n Eddy: Book of Extreme Excuses. Ed, Edd n Eddy. Scholastic Inc. p. 96. ISBN 978-0-439-77941-8. ^ "Ed, Edd n Eddy: Jawbreakers! for Game Boy Advance". GameSpot. CBS Interactive. Retrieved July 27, 2011. ^ "Ed, Edd n Eddy: Giant Jawbreakers for Mobile phone". GameSpot. CBS Interactive. Retrieved May 27, 2012. ^ "Ed, Edd n Eddy: The Mis-Edventures". GameSpot. CBS Interactive. Retrieved April 20, 2012. ^ "Ed, Edd n Eddy: Scam of the Century for DS". GameSpot. CBS Interactive. Retrieved April 30, 2012. ^ "Ed, Edd n Eddy: Jawbreakers". Metacritic. CBS Interactive. Retrieved July 23, 2012. ^ "Ed, Edd n Eddy: Giant Jawbreakers". GameRankings. CBS Interactive. Retrieved July 23, 2012. ^ Ed, Edd n Eddy: The Mis-Edventures scores at GameRankings: PC, GC, PS2, XB. CBS Interactive. Retrieved July 23, 2012. ^ "Ed, Edd n Eddy: Scam of the Century". Metacritic. CBS Interactive. Retrieved July 23, 2012. ^ "Cartoon Network: Block Party Announced". IGN. News Corporation. March 15, 2003. Retrieved April 30, 2012. ^ "Cartoon Network Speedway". IGN. News Corporation. March 3, 2003. Retrieved April 30, 2012. ^ Blancato, Joe (February 22, 2008). "GDC 2008: FusionFall, Cartoon Network's MMOG". The Escapist. Themis Group. Retrieved April 28, 2008. ^ Cartoon Network, Grigon Entertainment (January 14, 2009). Cartoon Network Universe: FusionFall. Microsoft Windows. Cartoon Network. ^ "Ed, Edd n Eddy". Cartoon Network Shop. Archived from the original on July 14, 2012. Retrieved April 30, 2012. Cartoon Network Halloween Volume 1: 9 Creepy Capers (August 10, 2004)—"Dawn of the Eds"
Cartoon Network Christmas Volume 1: Yuletide Follies (October 5, 2004)—"Fa-La-La-La-Ed"
Cartoon Network Halloween Volume 2: Grossest Halloween Ever (August 9, 2005)—"Honor Thy Ed"
Cartoon Network Christmas Volume 2: Christmas Rocks (October 4, 2005)—"Jingle Jingle Jangle"
Cartoon Network Halloween Volume 3: Sweet Sweet Fear (September 12, 2006)—"Don't Rain On My Ed"
Cartoon Network Christmas Volume 3 (October 3, 2006)—"In Like Ed"
^ "Ed, Edd n Eddy's Big Picture Show". iTunes Store. Apple. Retrieved April 30, 2012. ^ "Netflix scores deals with Turner, Warner Bros". CNET. January 14, 2013. Retrieved January 14, 2013. ^ "Netflix everything leaving in March". Business Insider. February 25, 2015. Retrieved August 28, 2016. ^ "Subway Kids' Pack". SubwayKids.com. Archived from the original on June 8, 2004. Retrieved June 2, 2012. ^ "Ed, Edd 'n' Eddy – Season 1, Vol. 1 (1999)". Amazon.com. ASIN B0007MSU2G. ^ "Ed, Edd And Eddy — Volume 1 Edifying Ed-ventures [DVD]". Amazon.co.uk. ASIN B000B7KXCC. ^ "Ed, Edd 'n' Eddy, Vol. 2 – Fools Par-Ed-Ise (1999)". Amazon.com. ASIN B000CQM4II. ^ "Ed, Edd 'N Eddy: The Complete First Season (1999)". Amazon.com. ASIN B000GETU2E. ^ "Ed, Edd N Eddy Season 1". Madman.com.au. Madman Entertainment. Retrieved July 10, 2012. ^ "Ed, Edd 'n' Eddy: The Complete Second Season (1999)". Amazon.com. ASIN B000M4RG7O. "The Ed-touchables" / "Nagged to Ed"
This page was last edited on 13 April 2019, at 19:46 (UTC).